The Speed Triple is the definitive icon for a commanding urban presence, combining determined, hard-charging looks with a full-on sports bike performance from its engine and chassis. With a heritage stretching back to 1994, over 70,000 discerning Speed Triple customers have found out what an outstanding combination it delivers. 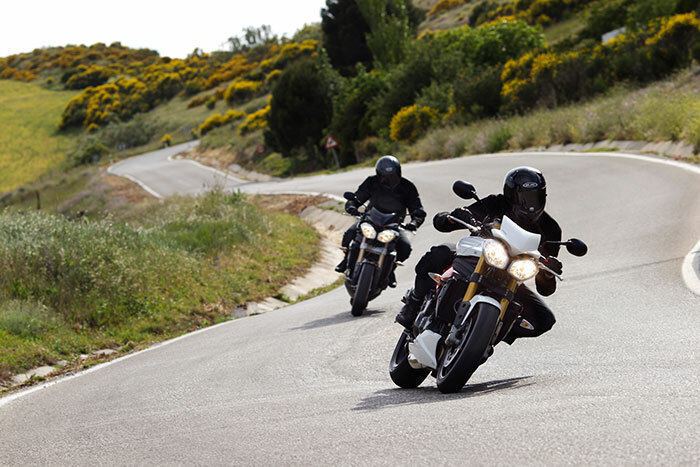 Signature Triumph exhaust and airbox growl delivers distinctive presence. Stripped back bodywork, it looks muscular, hunched forward, mean and aggressive because that’s exactly what the Speed Triple is. A thoroughly modern twin-tube, twin spar frame wrapped tight around a bulging powerhouse of an engine. 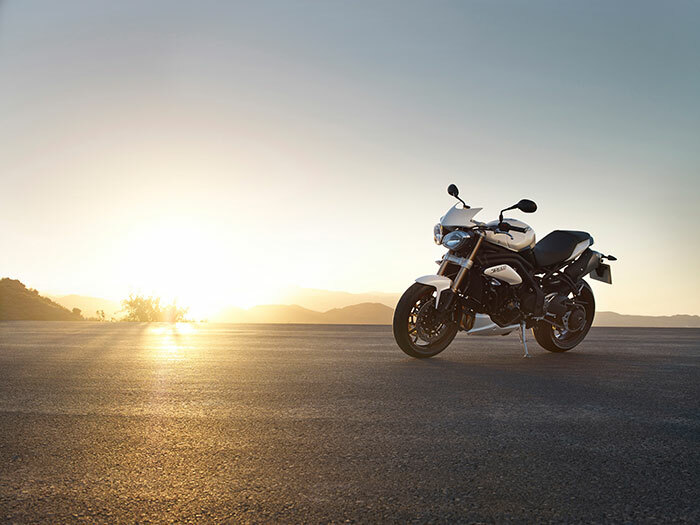 The Speed Triple’s unmistakable structure is pure unadulterated Triumph. 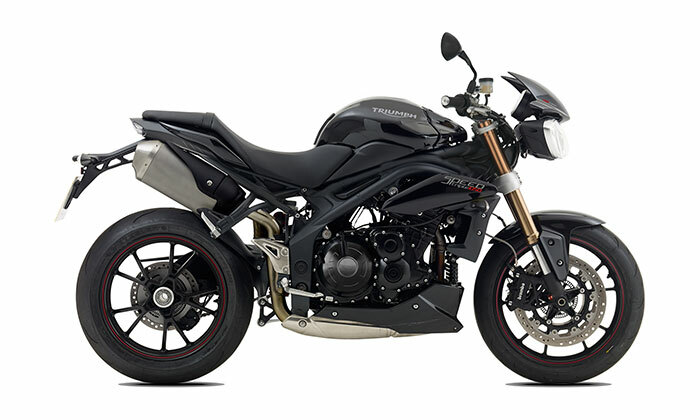 The twin silencers beneath the short, stubby tail section of the Speed Triple leave the rear wheel fully exposed on the right by the cool, single-sided swingarm. Not for looks, for real world sports bike riding. It just happens to look great. The trademark twin pentagon headlights ensure there’s no mistaking what’s coming. Factory colour matched Fly screen diverts air from the rider to reduce wind blast and increase comfort. Aggressively styled in line with the motorcycle, the fly screen is manufactured from high impact ABS for durability. Factory colour match seat cowl offers a quick, easy change of look for solo riding. The power of the Speed Triple comes from a muscle-packed three-cylinder, 1050cc engine. Serious top end performance comes from a huge 135PS, backed up by 111Nm of peak torque with plenty more muscle lower down the rev range. Giving you instant thrust regardless of revs or gear. And, with our high tech fuel injection all the power comes smoothly and relentlessly, right when you ask for it. The liquid-cooling, double overhead cams of the Speed Triple operate 12 valves and rev out beyond 10,000rpm. And, we’ve finely tuned the three-into-two exhaust like a musical instrument to enhance the engine’s torque and make it snarl even more angrily as the revs build. 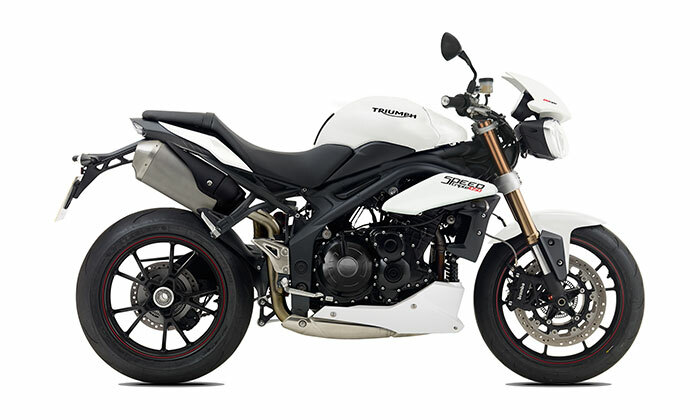 The Speed Triple introduced an all-new frame in 2011 to give you more forward weight distribution for sharper handling and exceptional front end feel. And we’ve kept the geometry sharp, with a steep 22.8 degree steering angle, short 1435mm wheelbase and just 90.9mm of trail to give you breathtaking responsiveness and agility. The upside down forks on the Speed Triple are high quality Showa units, 43mm in diameter with adjustable rebound and compression damping, while the centrally mounted, single rear shock also has adjustable spring preload. So you can set the Speed Triple up for a gentle outing or an on-the-edge track day and it’ll perform brilliantly. To match the Speed Triple’s level of handling and power we fitted Brembo’s radial four-piston calipers, with the option of ABS, for outstanding stopping power and feel. We fitted lightweight cast aluminium wheels and a wide 6inch rim on the back to take the grippiest, sports-focused rubber the Speed Triple deserves. The swingarm is aluminium and features an eccentric chain adjuster so that the rear wheel stays perfectly in line with the front for focussed, precise handling. swingarm is also incredibly stiff, resulting in a super-stiff chassis that’s rigid enough for the hardest track use and tough enough for real world roads. The Speed Triple is all about high performance precision and control. So the bars are low, the footrests high and set back and the seat is sculpted deep to hold you in a forward-leaning position. As you take control of the Speed Triple you are in no doubt that it’s made for sports riding, but you can tell we built it for the real world too. We’ve made sure your bike is protected by a coded key immobiliser system which disables the ignition if it detects an attempt to turn or force the ignition switch without the presence of the electronically coded correct key. 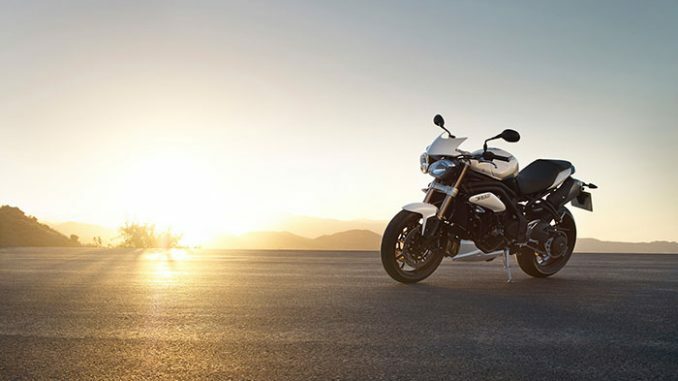 A serious bike needs a high level of equipment so the Speed Triple, with its modern, single purpose chassis, is driven by the latest technology. The instrumentation is part digital, part analogue so that you are presented with the most intuitive display of information. We also added programmable gear change lights, service interval reminder, lap timer, trip computer and fuel gauge, everything the focussed performance rider needs. exhaustStainless Steel 3 into 1 into 2, twin high level stainless steel silencers. brakes frontTwin 320mm floating discs, Brembo 4-piston 4-pad radial calipers. Switchable ABS. brakes rearSingle 255mm disc, Nissin single 2-piston sliding caliper. Switchable ABS.